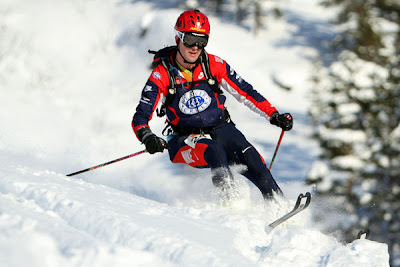 Chris racing in the Scandinavian Ski mountaineering Champs in the weekend - looking surprisingly coordinated! I wasn't going to do third 'wicked weekend' post....but we just had such a great weekend up at Kårvatn again that I had to put some more photos up. There was a lot of fresh powder and the skiing was awesome. Having only been on the skis once two weeks ago I was not so game to take part in the competition, but Chris being Chris decided to have a go. I went up and took some photos and enjoyed the delicious powder downhills! Chris was a bit disapointed with his speed uphill, many Swedes and Norwegians were much faster. He also had problems with his skins, having them fall off five times due to poor technique and getting snow all over them (bad idea we now know). It seems having a skin fall off is almost the equivalent mishap as a 'flattie' in road racing - although it is not quite as costly on time. We headed out for some powdery fun the following day. Carrying the skis up the last bit to the summit. The racers had this as an 'obligatory ski carry' section. There might be a gap from snowy write ups for a while - I am heading back to NZ for a 3 week visit. Chris is planning on joining in on another ski mountaineering weekend before he heads for a week of orienteering in Portugal. Hey that looks awesome. Not sure about looking co-ordinated though. How many times did he crash? I think it was worth doing another post just to launch those photos into the Blogosphere! Wow - all that snow looks gorgeous! Great weather for it also! Thanks guys, it was delicious powder and as you say Mark, very 'blogosphere worthy' material (-: Chris did crash about 10 times in the race Steve, so you are right, coordination may be a deception!